It’s that time of year again…some can’t wait for it and others wish for just one more week of summer with their kids! And if you are like me, your mind oscillates between the two on any given summer day. I love having my kids home, but I also need some structure to my life after almost three months without much of any. 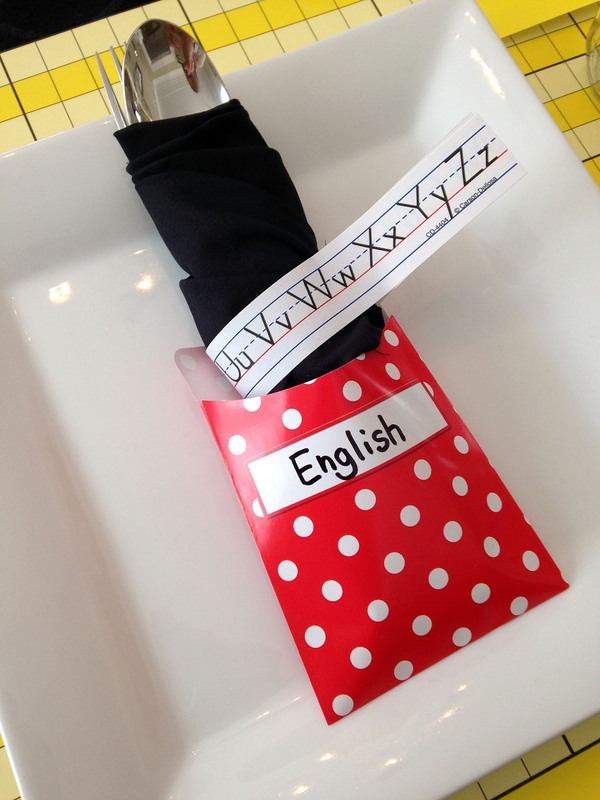 I always try to make the first day of school extra special with a fun breakfast or an after-school snack. It doesn’t take a lot to make the “everyday” a bit more meaningful…just adding a few extra touches to your table can turn a regular meal into something pretty fantastic for your loved ones! 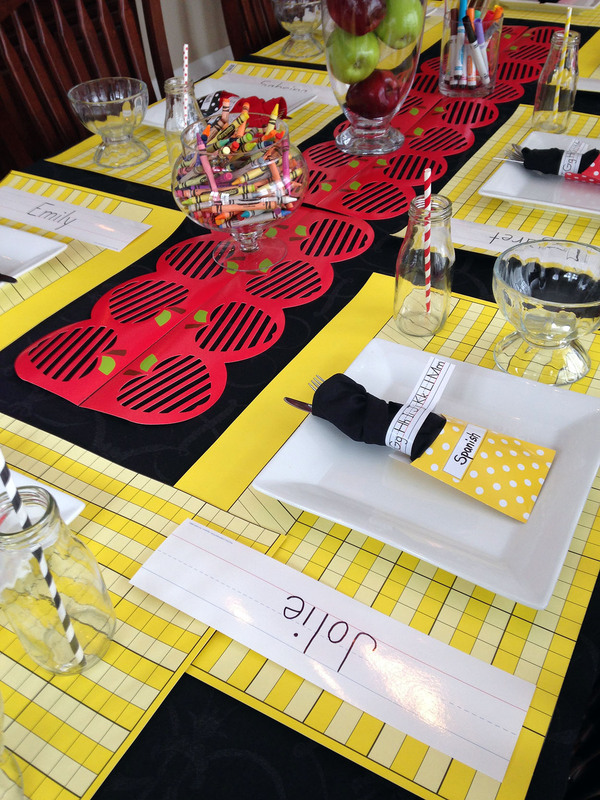 Today I’m sharing table decorations that could be used for a back to school breakfast, lunch, or party. This event was actually was for my high school daughter and her friends a few years ago…it was a luncheon for them following their semester exams. 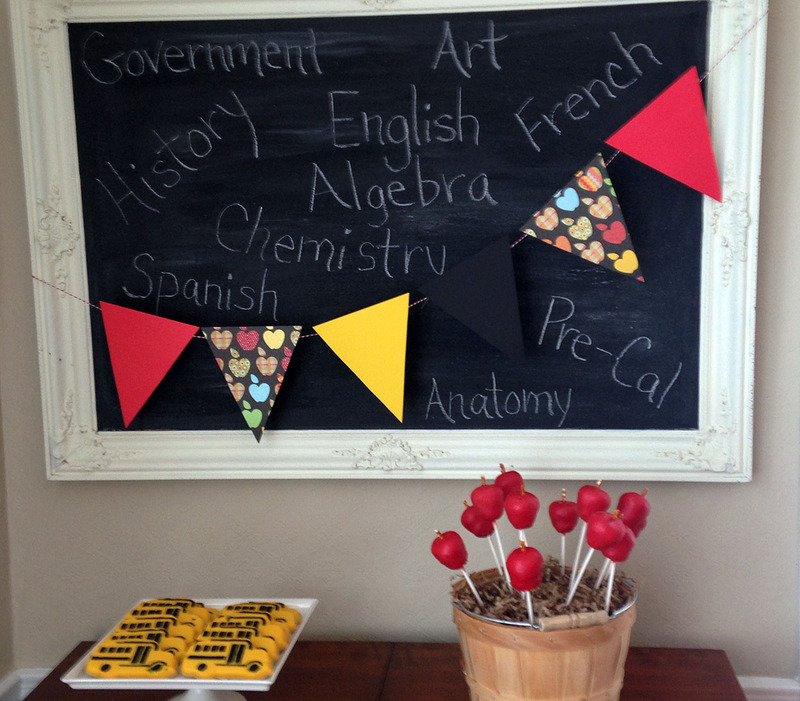 However, these decorations could be used for any school-theme event! This may surprise you, but I purchased most of these table decorations at our local school supply store. As a former teacher, I’m quite familiar with these types of stores…I used to spend hours looking and buying items for my classroom! 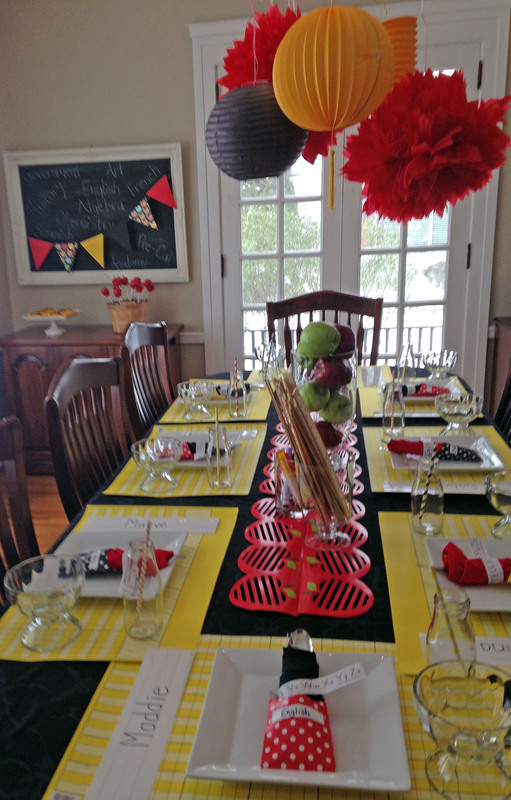 It was so fun to shop there for these decorations, instead of the typical party supply store. 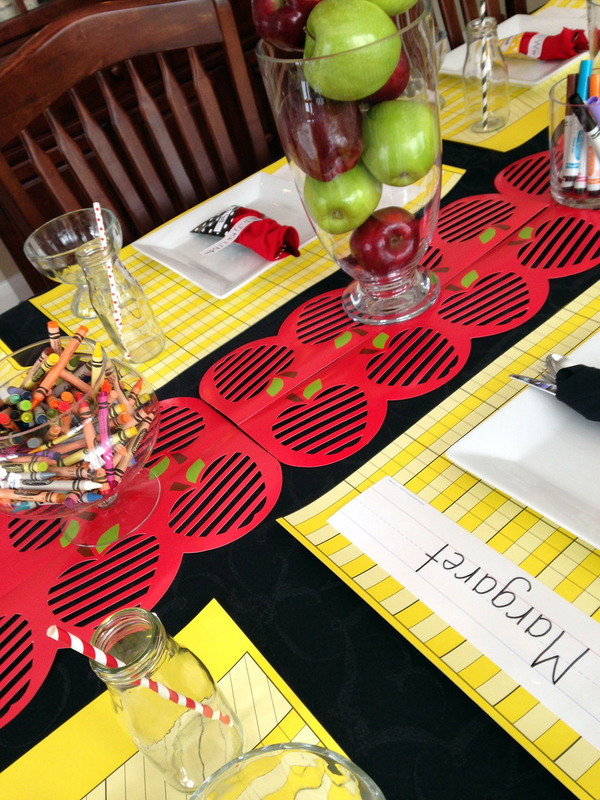 I started with a basic black tablecloth, and then I made a runner down the middle with red apple cutouts. Their original purpose was to decorate a classroom bulletin board, but I think they made a colorful statement on the table. 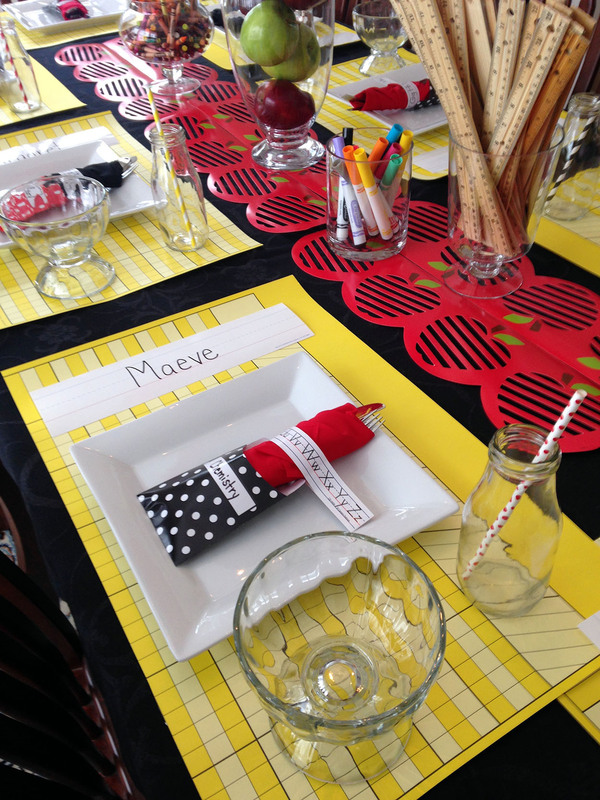 On top of the apple runner, I placed glass jars and vases filled with school supplies…rulers, crayons, and markers…AND some fresh apples. 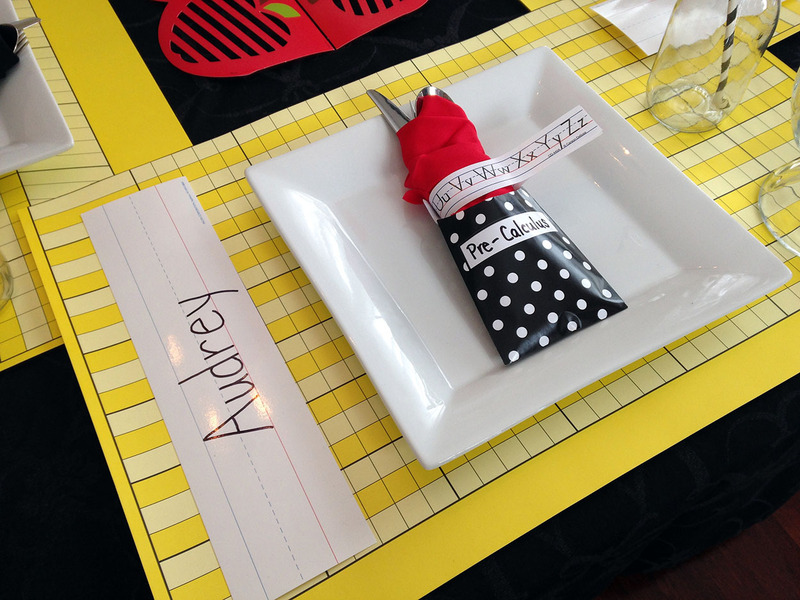 I used yellow incentive charts as placemats for the individual settings. 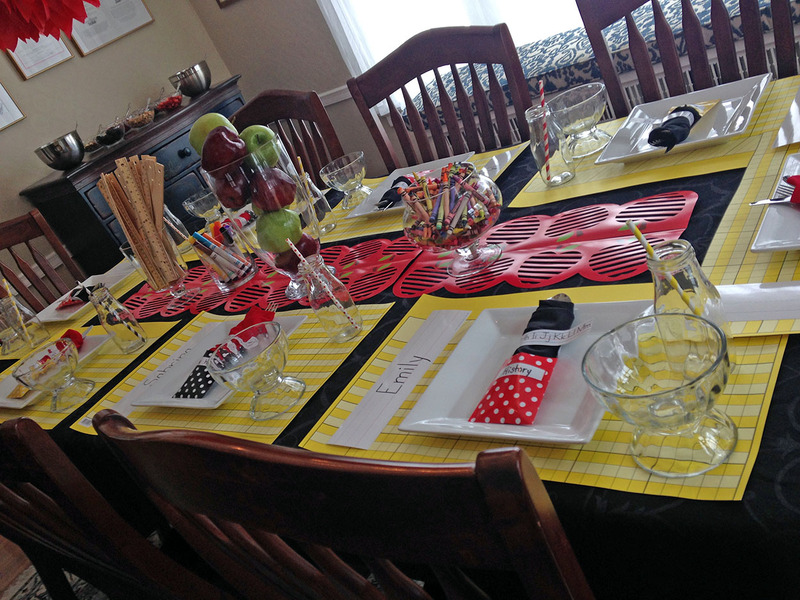 I cut them in half because they were too long…so I was able to get two placemats out of every chart. 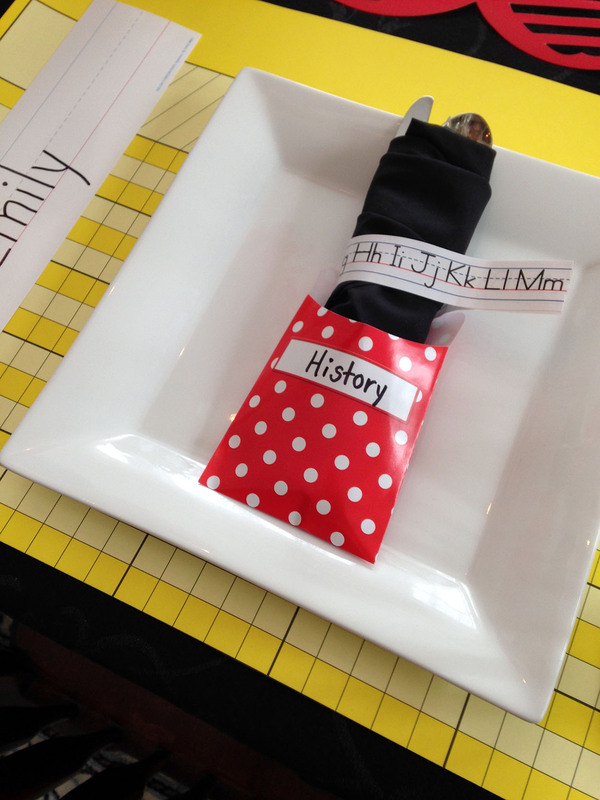 Blank sentence strips were perfect for writing the guests’ names and then using as a place card.
. These were then placed in small, colorful, polka dot envelopes…the various exam subjects were written on the front of them. 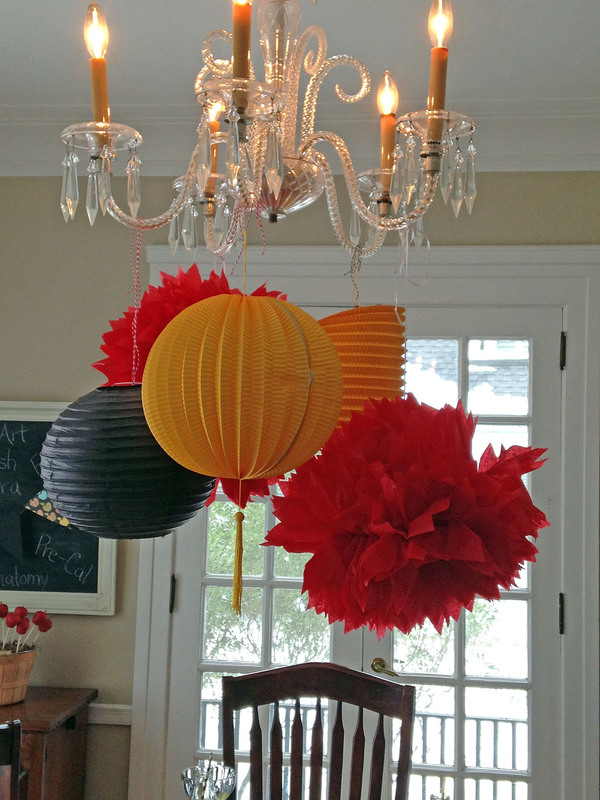 Other small touches to the room included the tissue poofs and paper lanterns that hung from the light, as well as the decorated chalkboard and banner. 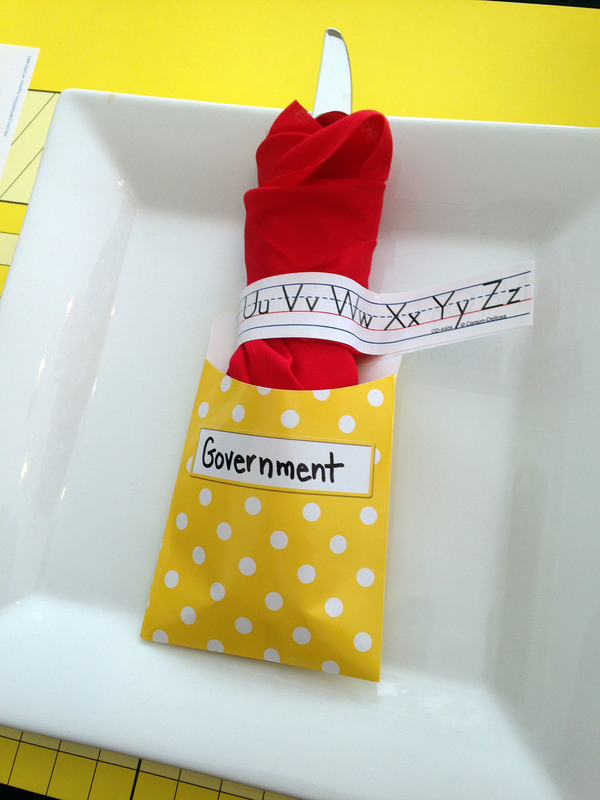 The food served that day was quite simple, but I think the decorations were what made it a bit more special! And most of them came from a school supply store!! 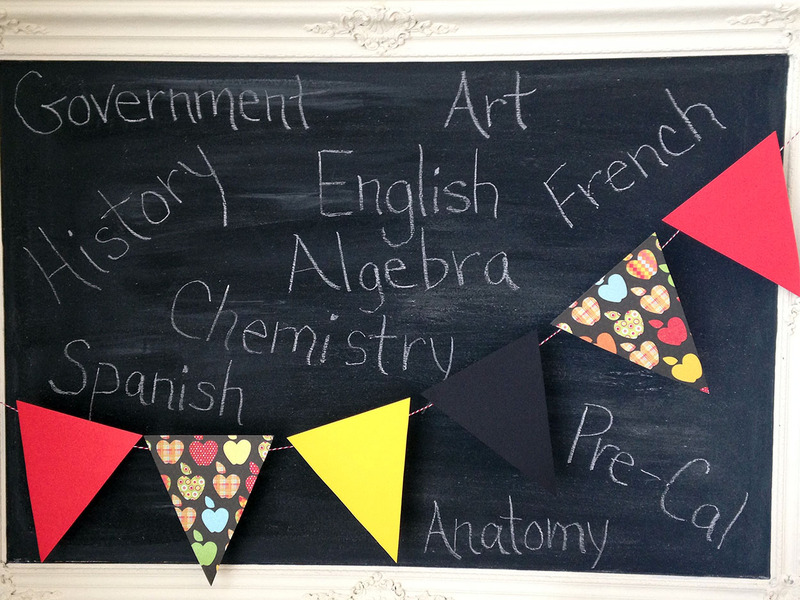 Starting a new school year can be so exciting! Good luck to everyone going back for another year of learning! !